The global head of Citi wanted to say “thank you” to employees with a luxurious piece that could be showcased on their desks. We created a calendar holder that offered up a motivational blurb each month. 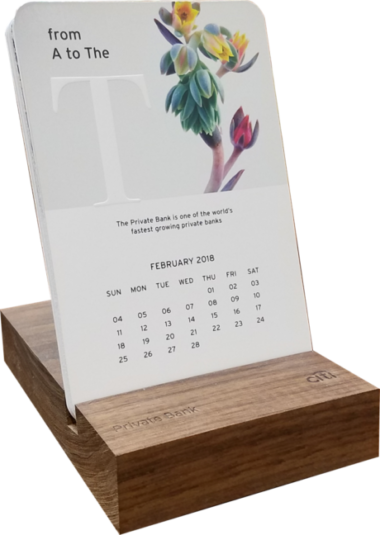 The base of the calendar was made of walnut and could alternatively be used as phone holder. The calendar hold was crafted with embossing, die cutting and spot UV treatment. We also created a box to house the calendar as it was to be shipped to all international employees. let’s make something big together today!